When the moon is at its closest point to the earth, (within 224,834 miles measured from the center of the moon to the center of the earth). The term 'super moon' was coined by an astrologer, Richard Nolle, over 30 years ago but was popularized by the media in 2011 to describe what astronomers always referred to as a perigee full moon, or a perigee new moon. On average there are 4 - 6 "Super Moon's a year, so they are not uncommon. Why mention them? 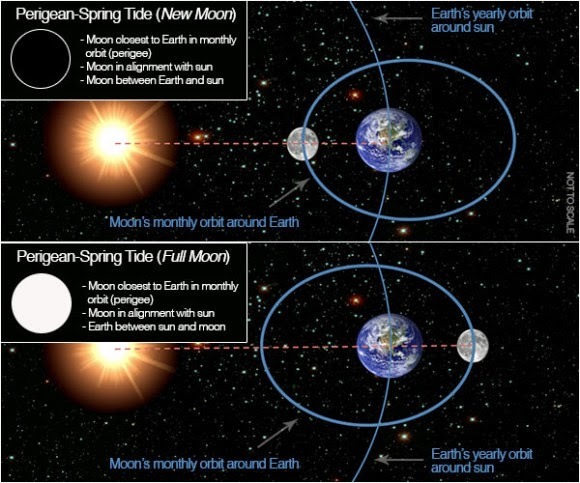 There is coming a rare occurrence of a super (full moon), which is also a blood moon and it is the final blood moon of the current blood moon tetrad, and it happens to be on September 28, 2015 - which is Sukkot (the Feast of Tabernacles) and the beginning of the Hebrew year of Jubilee, and this blood moon will be seen in Jerusalem, Israel. The Feast of Tabernacles is one of the Seven Feasts of the LORD, three of which are "pilgrimage convocations" in which all Jewish males were required to attend at Jerusalem to "appear before the Lord." Deu 16:16 Three times in a year shall all thy males appear before the LORD thy God in the place which he shall choose; in the feast of unleavened bread, and in the feast of weeks, and in the feast of tabernacles: and they shall not appear before the LORD empty. In the seventh Sukkot, not only all Jewish males, but the entire population was required to attend, and listen as the King of the Jews would read from the Law. In Sukkot, not only all Jewish males, but the entire population was required to attend. Not only is Sukkot, 2015 a special feast, but it is in the seventh year, or a Shemitah year . Do you get the feeling that this is building up to a climax of historic proportions? Yet again there is more. Not only is this a Shemitah year, it is the seventh Shemitah, or a Shemitah of Shemitah's, and a completion of 49 years and which the following year is the 50th year which is the Hebrew year of Jubilee. AS Rabbi Jonathan Cahn has said, most of the economic shocks to the U S economy have happened on the 29th of Elul, in a Shemitah year. In 2015 (a Shemitah year) the 29th of Elul occurs on Sunday, September 13th which is the eve of the Feast of Trumpets (Rosh HaShanah). Any financial collapse would (most likely) not happen on that date since the markets are closed. However, the last business day before that closure would be Friday, September 11th, which has a hauntingly historic significance for Americans. Many Jews and Christians believe that the coming of Messiah will happen on the Feast of Trumpets. Who that Messiah is, among Christians, there can be no doubt - it is none other than Jesus Christ, who fulfilled 315 prophecies. Many Jews yet reject Him as Messiah, and Jesus predicted that. Jesus said that in rejecting Him, they would receive another - a false Shepherd. Have you received Jesus Christ as your Savior and Lord? He stands at your hearts door and has been knocking. Won't you invite Him in? He will forgive your past and He will come in to your heart and He will give you a future that you could never earn on your own..